I’ve updated my for sale/trade page to include more items I’m wanting to sell or trade off. Please visit the linked page to find out what I’m looking for. (Strange Aeons game, hint, hint!). Not necessarily gaming related, but I found this video from one of my educational links. It’s of Prague’s Astronomical clock built in 1410. On its face was displayed an amazing light show- Not your typical lasers, but this was simply astounding. The wonders of technology continue to amaze me as well as the skill and artizanship of those working centuries before. Those of you heavily into role-playing can use this as a great location for some adventuring, or some Cthulu-esque horror story. So, I was just sent an invite to Google’ s new social media app called Google +. I’m curious as to the extent a person can use it in gaming. I really wanted to try and use Google’s Wave project for gaming, but it seems it never took off. Do any of you have any suggested uses for gaming with Google +? I received my new airbrush and compressor a couple of weeks ago and found using it is fairly simple- However, learning the technique to control paint is another story. I did some of the practice steps, then couldn’t wait any more to try laying some paint onto a model. I used a WM model and layed down some good transitions, but when I switched to the smaller of the three needles, the paint wouldn’t spray. My guess is the paint was too thick. I stopped at that point as it was 1am in the morning. The compressor didn’t work out of the box, but a quick ship back to Paasche got me a new compressor. In addition, they comped me an in-line water trap and air brush cleaning kit for my troubles. Good customer service. The original business who sold me the supplies weren’t very understanding. The Precinct Omega minis are on hold. 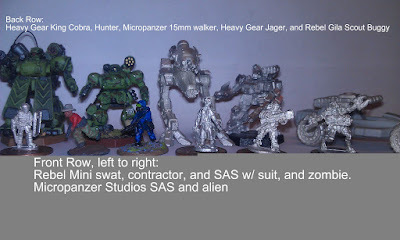 I won one of their minis and ordered the second one, but the review is on hold until I finish the two painting projects listed below. I really would like to do them justice, so they wait in line. Finally, my review of the Hell Dorado core book is a work in progress. I just need to finish going through the book and writing up the review to post here. 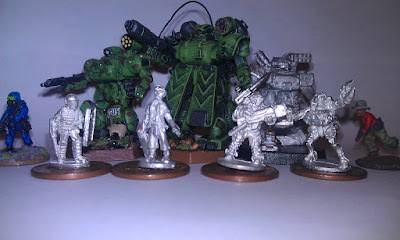 I have several of Cipher’s Hell Dorado minis now, and I need to really get some paint on them. I want to watch this very much, but I’ll have to wait for it to be released in retail. I don’t have HBO. Plastic Polyhedral Precinct Omega Giveaway- Winner! I was fortunate to be browsing some blogs in early March and came across Plastic Polydra (PP) website running a free mini giveway on the Monday Mini review. 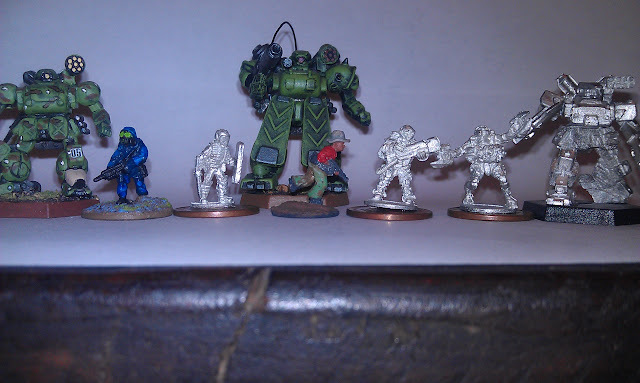 The Monday Mini was about Precinct Omega’s new line if miniatures. The contest involved identifying additional characters not mentioned on the PP website. A little sleuthing and I found my answer, which was quickly submitted. I was notifed that I was the winner, and asked for the Capt. of the Swords and went ahead and bought their Fairy Emissary. I’ll be posting a mini review of the two models that I received earlier today when I can.
. The price of your current plan is changing from $16.99 a month to $19.99 a month. This new price will be effective with your next billing statement on or after January 2, 2011, and will be referenced in your Membership Details. With your current plan you can both instantly watch unlimited TV episodes and movies on your computer or TV and receive unlimited DVDs by mail. 2. We now also offer a new $7.99 a month plan which lets you instantly watch unlimited TV episodes and movies on your computer or TV. This plan does not include any DVDs. All the titles you can watch instantly on your current plan are also available on this new plan, and as a reminder, not all titles on DVD are available to watch instantly. This new plan is available immediately – if you’d like to switch to this new plan at any time, simply visitYour Account. With that in mind, I chose to cancel my Netflix account. I didn’t want a price increase for “unlimited movies and tv episodes two ways” that has grown dramatically. I want my previous service for my previous price; which I was happy with. Well, I’m no longer a Netflix customer. Daily Illuminator For Oct. 6, 2010: These “Munchkin” Labeled Dice Are Not Official! We have learned that the Polish company Q-Workshop, which produced the “Wicked Munchkin Die” and the “Munchkin Cthulhu Dice of Doom” under license, has shipped at least four other dice sets with the Munchkin (http://www.sjgames.com/munchkin/game/ ) trademark and images, and with rules advertised as for use with Munchkin ( http://www.sjgames.com/munchkin/game/ ) . None of these four sets went through our approvals process, let alone GOT approval. They sent me a photo of one prototype die in December of last year, and I commented . . . and apparently they asked one of our European MIBs for rules suggestions. That seems to have been it. But now we have found out that they made them and SHIPPED them.